My biggest passion in life, though, is Morris dancing. Morris dancing, in case there are one or two of you who have never heard of it, is a type of old English folk dancing, always performed by men. It can get pretty wild, since it involves a lot of swinging of clubs. A wonderful feeling of camaraderie builds up in men who Morris dance and we generally have drinks together afterwards. Sometimes too many drinks. Alistair Cooke once called Morris dancing ‘rugby for the effete’ but I think that’s an unfair characterization. We are non-profit, which opens up the possibility of grants. No luck so far, though. Last year we applied to the New York State Council on the Arts and they sent a woman to ‘audit’ one of our performances. All she did was sit in the back and giggle at the mistakes. observations: Once again pushing this book, because it is almost unknown and should be very very famous. Narrator Elliot is leaving his Morris Dancing troupe to head for the East Coast, where he is trying to track down an aged mistress of President Harding. A typical moment will happen when he sees a headline in the LA Times: FOUR THOUSAND OAKS RESIDENTS KILLED IN AUTO CRASH. Unfamiliar with the local geography, he is horrified by this news, but then finds out there is a place called Thousand Oaks. If that makes you laugh, then you will love this book. President Harding is a real-life figure, this particular mistress is fictional (though there was a similar figure in Harding’s life) – when the book first came out, this reader was fascinated by the story and wanted very much to know which characters were real and which weren’t, but researching it was difficult; 25 years later a few minutes on Google and you know everything you could wish to know. The book has featured before, as has Warren Harding, and the Aspern Papers - read the entry to find out about the connection. Elliot’s girlfriend Pam is very like Margaret in Lucky Jim. The picture of English Morris dancers is from Wikimedia Commons. 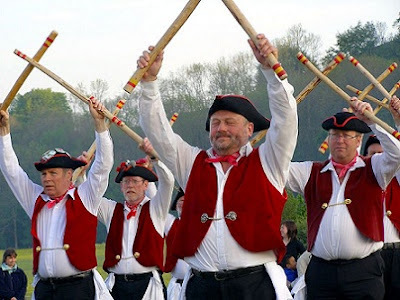 Our gardener in the Cotswds was a Morris dancer. I don't know about the fertility symbolism involved but he was quite the local ladies man and got around a bit! Moira - I've heard of Morris dancing, but never known much about it. You've got me interested! And if there's humour involved too, that much the better.